For many years, the image of 'beloved Albert' has been that of a man who was a bit dim, a bit of a political afterthought who stood by the Queen as she ruled her empire. Neither of these perceptions are true of course. 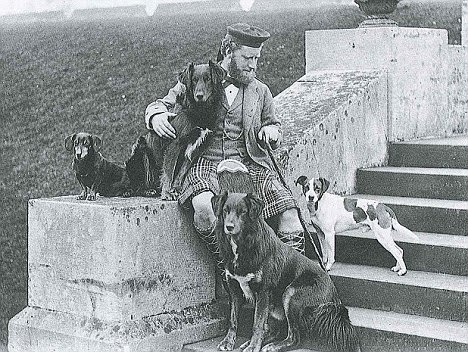 Letters from Victoria’s early life show she was a passionately romantic soul, scribbling up to 2500 words a day about Albert; how beautiful he was, how good he was in bed, etc etc. Much of the writing was destroyed after her death as such talk was not the done thing in Victorian times. Indeed table legs were covered up in those days, deemed to be too risqué. The happy couple. Do they look miserable or what? Much closer to the truth is that Victoria battled with her heart ruling her head, she spent her whole life kicking against domineering men who wanted to control her, and fighting with Albert. 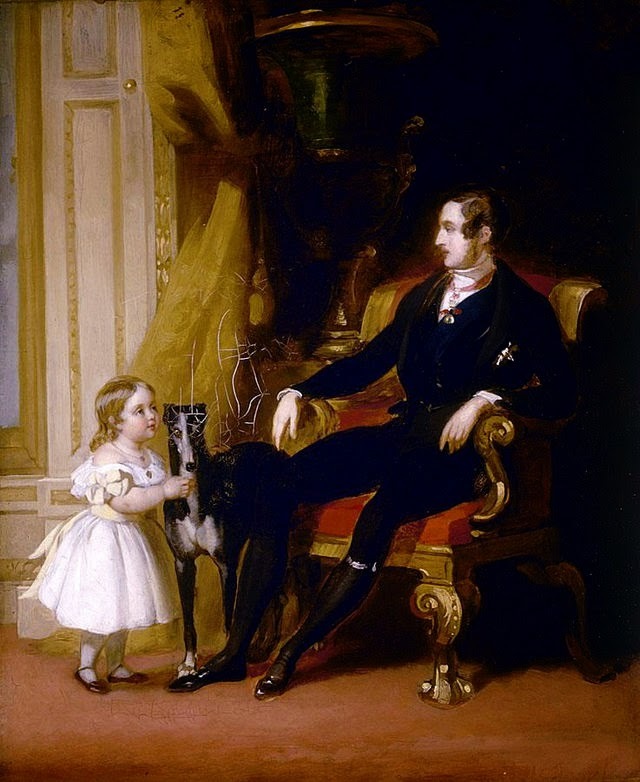 The Prince Consort, a rather clever and scheming soul wanted the Sax Coberg Gothe dynasty to marry into as many European Royal families as possible and to that end, Victoria had to produce as many children as possible. While running an empire. She had her first child within a year of marriage, robbing her of time alone with 'beloved Albert', and she bitterly resented that. She had a very poor relationship with her own mother, moving her out of the palace to an apartment of her own and making sure she stayed there. Maybe that lack of bonding, plus the Royals habit of seeing their children for fifteen minutes before supper every second Wednesday, seriously affected Victoria. She was little more than a baby factory. Her letters hint at post natal depression and horrific mood swings. They clearly show her frustration as Albert and his advisors pat her on the head over a good luncheon as they decide which child to marry off to who. Her eldest daughter Vicki was sent off for a walk to a romantic highland spot with a 25 year old suitor (Frederick The Third I think ) who she later married or was told to marry. Vicki was 14 at the time. After our disappointing visit to the Diana Memorial Non fountain, we walked up to The Albert Memorial (about seven minutes stroll). It is so spectacularly ostentatious you can’t help but admire it. When it was opened in 1872, it had cost 11 million pounds in today’s money to build. All paid for by public subscription. Albert had died eleven years previously at the age of 42, of typhoid or Crohn’s disease or stomach cancer. 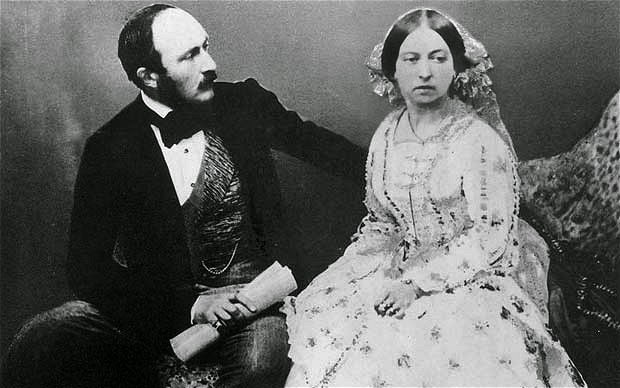 It was when Albert died that Victoria grew confident on her own abilities and evolved into the political powerhouse that had elder statesmen quaking in their breeches. She was probably the last of the monarchs who had her opinion listened to and valued by the government of the day. Nowadays some of the Royals can't be trusted to put their shoes on the right way round. I'm sure Stan and CO would come up with a mathematical model to prove how much cross breeding should take place before the chinless wonder, good with horses, can't walk and chew at the same time gene comes into play. But in all seriousness, the number of other memorials around the UK, show what a popular chap Albert was. He was an astute politician, a true statesman with a powerful intellect, multi lingual and aware of the precipitous nature of the Empire and the social condition that some (most of!) Victoria's subjects lived under. His contribution to organizing the Great Exhibition of 1851 is well documented. And looking at the monument now, to me it smacked of imperialism and the empire, and when Britannia ruled the waves and all that stuff. But seemingly not. Or maybe the component parts have been reinterpreted to be more palatable and ethically sound. To me it just looked like a woman lording over her lessers! The central part is surrounded by the Frieze of Parnassus which depicts composers and poets on the south side , architects on the north side, painters on the west side. The Albert Memorial was influenced by the style of – the Scott Monument in Edinburgh which was designed twenty years earlier. Albert is shown looking south, towards the Royal Albert Hall. The canopy has two historical figures on each side, made from enamel, polished stone, onyx, marble and granite. King David, Homer, Apelles, Raphael, Solomon, Ictinus Phidias and Michelangelo all beautifully depicted. The pillars have statutes representing sciences: Astronomy, Geology, Chemistry, Geometry, Rhetoric, Medicine, Philosophy and Physiology. Around the canopy reads Queen Victoria and Her People • To The Memory Of Albert Prince Consort • As A Tribute Of Their Gratitude • For A Life Devoted to the Public Good. At the top of the canopy are eight statues of the moral and Christian virtues; Faith, Hope, Charity and Humility Fortitude, Prudence, Justice, Temperance. Above that gilded angels raise their arms heavenwards. Above that is a gold cross. By the late 1990s the Memorial had fallen into a state of some decay and it took twenty million dollars to repair it. The sprayed figure of Albert himself is now back to glowing gold leaf, for the last eighty years it has been covered in black paint. Theories are that it was blackened during World War 1 to stop it being a target for Zeppplins, other theories that it was part of the anti German sentiment that was prevalent at that time. During the restriction though they found out that the black paint pre dated the WW1 and might have been an attempt to protect the leaf from atmospheric pollution. As it stands at the moment, you can walk round it but there is a padlocked gate which is open for guided tours where all the above will be explained in great detail just in case anybody gets the wrong end of the stick and thinks it’s a monument to the Imperialist past when Britannia really did rule the waves. And anything else she could get her hands on. Great post, Caro. It's made me consider Queen Victoria in a whole new light. I think of her in her latter years without considering what she went through in order to get there. Hmm. A story of how a great woman came to escape the stereotype and rewrite history. Seems to apply to at least six I know from just these parts. To which parts of the six women are you referring, Jeff? Left-Coast-Crime-Attendees: Is it too early to think about organizing an MIE get-together? As soon as I read, "a few stolen moments in her later years warming her bunions with Ghillie John Brown," I knew it was your turn to write. Yes, apparently Victoria was a baby factory and it has been said by some that those babies spread hemophilia through the royal houses of Europe. All told, a sad family. Your detailed descriptions and history, Caro, are very interesting. As were your summaries of those destroyed letters! Thank you kind bloggers for your comments. It does make you wonder what the female brain could have achieved if it had not been stuck back in the cave soothing the cheek of the troubled infant. What diseases would we have cured, what would we have discovered? Calorie free chocolate? And yes Barbara, Victoria was a carrier of heamophilia. Her son Leopold was a sufferer and her daughters Beatrice and Alice were carriers. ( it's on the X chromosome so it's a man thing - like lager and reverse parking). Geneticists say that the European Royal family - with it's inbreeding was a perfect storm for a female to present with truly inherited heamophilia (rather than the mutated sort) but there is no record of it ever happening . Probably due to the child dying so young, as many of them did. Guess Who's Coming to Murder is Everywhere!